In the usually tranquil streets of Asunción, the capital of Paraguay, there is a growing sense of unease. The death of retired general and presidential candidate Lino Oviedo in February, in a suspicious helicopter crash, has heightened the tension marking an already fraught transition following the impeachment of the left-leaning President Fernando Lugo last June. 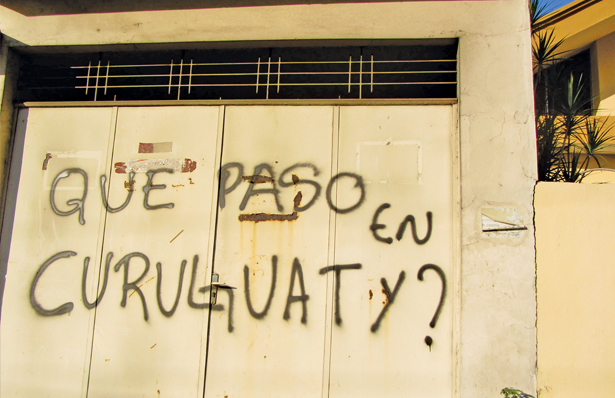 On city walls, graffiti demands an answer to the question “Que pasó en Curuguaty?”—the rallying cry at a protest of 5,000 people last December, which refers to the rural border region where a clash between police forces and landless peasants culminated in the death of seventeen people (eleven civilians and six policemen) last year. The tragedy, which took place just one week before Lugo’s impeachment, was seized upon by his opponents, who pushed for his ouster on the grounds that the president had fomented “the fight between rich and poor” by holding talks with peasant leaders. As Paraguay prepares to elect a new president on April 21, a growing number of citizens believe that answering the question of what happened in Curuguaty is the key to the truth behind Lugo’s impeachment. A former Catholic priest and the bishop of Paraguay’s poorest diocese, in the rural department of San Pedro, between 1994 and 2005, Lugo was never popular with the country’s economic elite. He won the presidency in 2008 by forming a coalition with Paraguay’s Authentic Radical Liberal Party (PLRA), the second-largest in the country, and choosing Federico Franco, one of the party’s main figures, to run as his vice president. But the coalition soon proved fragile; leaders within the PLRA opposed a number of his policies—for example, forging a relationship with neighboring countries like Venezuela, Bolivia and Ecuador. Lugo governed alongside a Congress heavily opposed to him, and he was repeatedly faced with the threat of impeachment—even from the liberals. WikiLeaks cables reveal that the US embassy was aware of rumored conspiracies against Lugo since he first rose to power. “Many believe that political actors…are waiting for Lugo to make a big mistake that could serve as grounds for impeachment sometime in the next four years,” then-Ambassador Liliana Ayalde wrote in a classified cable on August 9, 2009. The same cable acknowledged that, despite US fears, Lugo was not turning out to be “a radical leftist of the Bolivarian persuasion”—he did not, for example, deliver on the land reforms pushed by Paraguay’s social movements. Nonetheless, in the poorest country of South America, where 2 percent of the population controls more than 75 percent of the fertile land, his politics were seen as too radical for the conservative establishment. Lugo’s closeness to left-leaning South American leaders and his support for Unasur—a geopolitical alliance with a focus on military collaboration as a counterbalance to American influence—was a thorn in the side of pro-US legislators in Paraguay and was used to argue for his impeachment. Lugo also displeased big landowners in Paraguay’s increasingly GMO-driven economy. The country is the world’s fourth-biggest soy exporter, and his attempts to regulate the use of pesticides and GMOs would be quickly reversed by his replacement, Vice President Franco. Elsewhere, Lugo’s overthrow was seen as a coup, and today Paraguay is isolated throughout the region, having been suspended by Unasur as well as Mercosur, the Common Market of the South. In the meantime, within the country, Paraguayans are demanding justice for the people killed in Curuguaty, as well as a full accounting of the events on that day. On the morning of June 15, Police Commander Paulino Rojas gave the Paraguayan National Police the order to evict seventy landless people who were occupying 2,000 hectares of land in Curuguaty. The supposed owner of the land, Blas Riquelme, was a known land grabber and former president of Paraguay’s conservative opposition party, the Partido Colorado (Colorado Party). But it was Riquelme who was occuping the land unlawfully; its rightful owner was the Instituto Nacional de Desarollo Rural y Tierra—the Paraguayan Land Institute—which tried to fight the eviction, only to be ignored by the local courts. The institute was not alone in resisting the eviction. Several members of Paraguay’s own National Police pushed to postpone the operation over fears that it would lead to a violent clash. Among them was Arnaldo Sanabria, head of the Special Operations Force GEO, as well as Erven Lovera, who would be the first policeman killed that day. After the killings, Commander Rojas made no mention of these warnings to Paraguay’s interior minister, Carlos Filizzolla, who would conclude that the force deployed to evict seventy peasants—?324 armed men and a helicopter—was disproportionate. Not only was the force disproportionate, but the eviction was extremely violent. A report later released by the NGO Plataforma de Estudio e Investigación de Conflictos Campesinos (PEICC) showed that policemen manipulated the crime scene, throwing bullet shells on top of corpses to make them look like criminals. The report also raised the question of whether some of the eleven peasants were executed and ?pointed out that many of those arrested had no connection to the conflict. The police found a list of people occupying the land and issued arrest warrants against all of them on charges of attempted murder—even people who were not present during the clash. Fifty-four peasants are still on the run. Three of them fled to Argentina, where they were granted refugee status. The massacre in Curuguaty was investigated by prosecutor Jalil Rachid, whose father, like Blas Riquelme, the supposed landowner, was once president of the Colorado Party. Rachid claimed that the seventy peasants ambushed the 324 policemen, a conclusion based solely on police testimony. The peasants “did not come to testify because they were scared they would also be prosecuted,” he boasted to the press. The fourteen people arrested say they were tortured in police custody. Ruben Villalba, one of the leaders of the occupation, who is in a prison in Asunción, says he was “beaten up” and that “there was psychological torture,” too. “They said, ‘You belong to the guerrilla.’ One police chief jumped on my back while I was on the floor and cried, ‘Hurra!‘ I felt like I was a trophy,” he says, crying at the memory. For prosecutor Rachid, Villalba is indeed a trophy, the official mastermind of the ambush and the man most responsible for the tragedy. Franco, the newly installed president, seconded this judgment, calling Villalba a murderer months before his trial was even scheduled. The prosecutor-general, Javier Díaz Veron, also praised the official investigation. Months later, unidentified gunmen murdered Vidal Vega, a peasant leader who was a key witness to the events. Vega had supported the land occupation as well as the investigation by PEICC. His murder this past December sparked an outcry in Paraguay, and Amnesty International and the United Nations demanded that the crime be investigated. It is no coincidence that the eviction of the residents of Curuguaty was supported by the same lawmakers who would oust Lugo almost immediately afterward. Six months before Lugo’s impeachment, the Colorado-dominated House issued a statement urging Lugo’s administration to move forward with the operation. The statement was written by Congressman Oscar Tuma of the Colorado Party, who would later write the articles of impeachment against Lugo. Lugo was ousted by a landslide Senate vote of thirty-nine to four. The process lasted less than twenty-four hours; his defense team had only seventeen hours to prepare a response to five accusations made by the House—among them that he fueled instability by not clamping down on the landless peasant movement. Lawmakers presented no evidence, simply claiming that the charges were “public knowledge and therefore do not need to be proven according to our laws.” That same day, Franco took office. The hasty impeachment raised concerns throughout South America, no stranger to US-facilitated overthrows. On June 23, the Inter-American Commission on Human Rights declared the speed of the proceedings “unacceptable.” The Bolivarian Alliance for the Americas went so far as to call it a coup d’état, while Unasur and Mercosur said it breached their democratic clauses. But the Organization of American States reacted quite differently. On July 1, a fact-finding mission led by OAS Secretary General José Miguel Insulza arrived in the capital. The mission had US fingerprints all over it; apart from Insulza, its members were Ambassador Carmen Lomellin, the US Permanent Representative to the OAS, along with representatives from ?US allies Canada, Mexico, Honduras and Haiti—the latter two having seen anti-US presidents ousted in the past decade. In his official report, Insulza concluded that while it was “natural that the situation that occurred in Paraguay prompted very negative reactions, it is not exactly a novel occurrence in our Hemisphere.” He acknowledged that the speed of the proceedings “created an aura of illegitimacy” but defended the impeachment, arguing that suspending Paraguay from the OAS would be counterproductive. Instead, he said, the OAS should throw its support behind new elections. “So it was not a coup d’état?” a journalist asked Jacobson. “I’m not going to answer that question,” she snapped. The Threshold program began in Paraguay in 2006 to “strengthen the rule of law” and fight corruption, and was renewed after Lugo’s election two years later. The program is funded by the MCC—an independ-?ent US agency created in 2004 to provide “smart U.S. Government assistance”—but administrated by USAID. Researchers at the Paraguayan think tank Base Investigaciones Sociales believe that the reason for the additional USAID investments following Lugo’s election was to prevent his policies from becoming too leftist—and to prevent his administration from becoming too close to Venezuela, Bolivia, Ecuador or Cuba. “The increased presence is not exclusively centered on bilateral support, but also includes more financing to a big diversity of actors, among them non-government organizations, business associations and cooperatives,” they concluded in a report released last December. During the first phase of the Threshold program, funding was channeled to some of the very institutions that would play a central role in impeaching Lugo six years later, including not just the police force but the Public Ministry and the Supreme Court. The Public Ministry has received $11.7 million in ?US taxpayer funds through the Threshold program since 2006. The Supreme Court has received $5 million. On March 29, the United Nations Human Rights Commission called on the government of Paraguay to investigate the killings in Curuguaty. The eighteen-member commission urged that the new investigation be “immediate, independent and impartial” and expressed concern with the allegations of improper conduct by the US-funded Public Ministry, the judiciary and the security forces, as well as over the “lack of impartiality and independence” among those responsible for carrying out the official investigation. And yet, even as Paraguayans prepare to go to the polls on April 21, the massacre has been largely absent from the media and has remained undiscussed during the presidential campaigns. So have the questions regarding the legitimacy of Lugo’s overthrow. The former president has called for investigations into the candidates from both the Colorado and Liberal parties—Horacio Cartes and Efraín Alegre, ?respectively—to determine whether they had any connection with the murders in Curuguaty. But such calls are likely to be seen as self-serving and will almost certainly fall on deaf ears among the Paraguayan elite. Nevertheless, those who survived the massacre are determined to seek justice and continue to push for a full investigation. Prisoner Ruben Villalba, who described his brutal treatment at the hands of police during his interrogation, is in the hospital. He has been on a hunger strike for more than fifty days. Others have joined his cause as an act of resistance to the official silence.